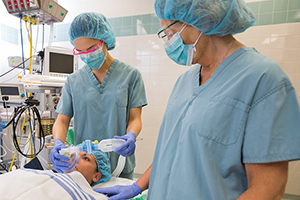 The National Institute of First Assisting, Inc. (NIFA) is a Colorado institution that specializing in health care education specific to operating room nurses and APRNs since 1995. 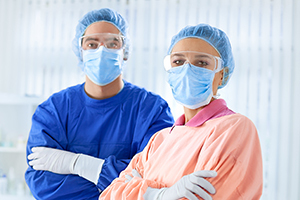 The NIFA RN First Assistant Program for APRNs is presented through accredited colleges nationwide, overseen by their accredited nursing programs and meets all AORN Standards for RNFA Education. Because of deadline of January 2016 in the new AORN Position Statement more APRNs will need this specialized training. This college RNFA online program addresses all the modules of the AORN Core Curriculum for RN First Assistants. In total, home studies would represent approximately 48 hours followed by a 140-hour internship which the student arranges at their facility. The NIFA program offers APRN students an optional SutureStar Workshop with up to 54 hours of hands-on labs, doing cases cut-to-close – including home labs to ensure retention. During the six day workshop, the APRN RNFA student will have placed and tied off approximately 400 sutures. Also, new APRNs to surgery attend a Monday night “APRN/VIP Night” to demonstrate knowledge of OR fundamentals and sterile technique. This hands-on experience is so comprehensive that, since 1997, we have guaranteed that an RNFA student will learn to master the skills of a competent and confident assistant or we will retrain them free of charge. We are the only program that presents cases such as AAA, ORIF, Colon Resection, TAH/BSO, C-Section, Laparoscopic, Endoscopic Vessel Harvesting, and Carotid Endarterectomy classes for a nominal charge to the student during the six day classroom portion of the program. Click here for the brochure. Many APRN students graduate between 5-8 months, but have two years to complete the program. Graduates receive a Certificate verifying that they have successfully completed the RNFA program designed specifically for APRNs, meets all the standards as set forth by the AORN and is accepted by the Competency and Credentialing Institute leading qualified graduates to the national exam. Your NIFA certificate is recognized by all 50 Boards of Nursing.